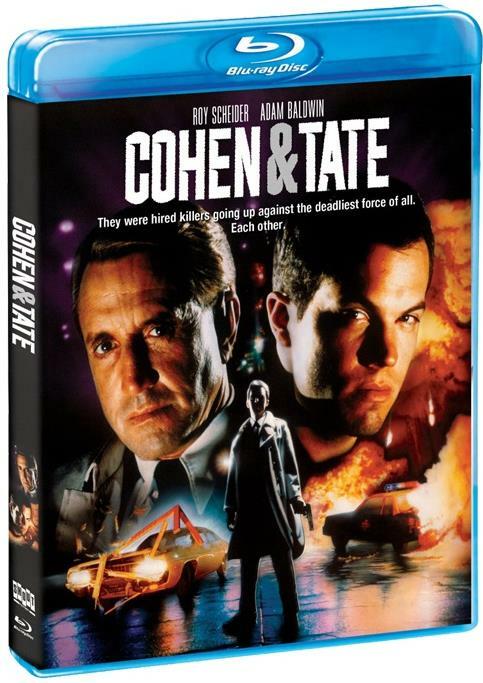 Schlock-Wire: COHEN & TATE Comes To Blu-Ray In July – Schlockmania! Cohen and Tate are two mafia hit men who don’t exactly hit it off. Cohen (Roy Scheider, Jaws) is an old pro, a cold-blooded killer who is all business. Tate (Adam Baldwin, Chuck) is a young hothead who kills for fun. Together they kidnap nine-year-old Travis Knight (Harley Cross, The Believers), an eyewitness to a recent mob rub-out. Now, they’ve got 24 hours to deliver him to Houston for interrogation and elimination. Realizing their mutual hatred is his only hope, Travis plays this lethal odd couple against one another. But when their volatile words explode into a fiery gun battle, he’s caught in the crossfire. Edited by EDWARD ABROMS, A.C.E. Director of Photography VICTOR J. KEMPER A.S.C.